Our guides: While our guides love being out on the ocean and enjoy watching seabirds, we never forget that YOU are our priority. We understand that this is your pelagic trip, and we will do our best to ensure you have the best trip possible. All our professional guides are trained and dedicated, and we are committed to helping you see and identify as many species of seabirds and marine mammals as possible. Tim Shelmerdine, long-time pelagic trip co-leader for The Bird Guide and now owner of Oregon Pelagic Tours, began birding in 1985. He was hooked on pelagic birds since his first trip that year. He has spent over 300 days on the ocean: he has worked as a deck hand on a fishing boat, and as an observer on a NOAA cruise, and has taken over 150 pelagic trips in the Pacific Ocean, from Alaska to Peru, as well as trips in the Atlantic. He looks for any opportunity to watch seabirds, and is known to bird from cruise ships and ferries. He has had photographs published in Oregon Birds and Birding and is a contributor to Birds of Oregon: A General Reference and the Oregon Breeding Bird Atlas. Tim has served Oregon Field Ornithologists (now Oregon Birding Association) as board member, secretary and multiple terms as president, and has been a member of the Oregon Birds Records Committee. He has birded extensively throughout North, Central, and South America, and Europe. Tim is a former high school Spanish teacher, coordinates and leads field trips for the Audubon Society of Portland, works as a part-time bird guide, and may occasionally be found at his home in West Linn. Email: tim.oregonpelagictours@gmail.com . Russ Namitz has been leading pelagic tours in Oregon since 2007. He has taken numerous pelagic trips off Alaska, Hawaii and Mexico as well as some east coast pelagic trips (NC, FL). He has traveled & birded extensively in the western US, Mexico & Central America and has also birded in South America & Asia. He currently divides his time teaching Biology part-time for Rogue Community College and conducting wildlife surveys for consulting firms and government agencies. David Mandell's pelagic birding career began at the age of five with a Horned Puffin off of San Diego. He has been hooked ever since, and has birded the Atlantic Ocean extensively from Maine to North Carolina. David has been leading pelagic trips off Oregon for close to fifteen years and is a past President of the Audubon Society of Portland. David lives in Portland with his wife Alex and son, Oscar. Shawneen Finnegan began birding in Northern California as a young woman. Being passionate about bird identification led to a career that included leading and managing tours for WINGS, being the Range Data Editor for Santa Barbara Software’s BirdArea for 23 years, and Photo Editor for Birding Magazine. She began leading pelagic trips in the 1980s for Debi Shearwater out of Monterey, California, and later off Florida and the East Coast. Shawneen is also an accomplished artist with her work published in many books, magazines, catalogs, on clothing, and held in private collections. Cape May was home for years (where her heart remains) and later Tucson. Since moving to Portland, Oregon in 2007 for family reasons, she completed a B.S. in Geography at Portland State University, conducted bird surveys and currently teaches several classes for Audubon Society of Portland. She recently took over Tony White’s State Checklist Newsletter for AviSys Software. She is a member of Oregon and Washington Bird Records Committees, and ABA’s Record Standards and Ethics Committee. Jim Danzenbaker started watching and studying birds and all things nature at the tender age of 6 in New Jersey. Eventually, his range extended up into New England and down to North Carolina. He participated in multiple pelagic trips off the Atlantic seaboard before moving west to California. He was a leader on over 300 pelagic trips off the northern California coast and, once again, extended his range to include locations off southern California and Japan. His birding advanced from forays to local hotspots to leading international birding tours to Central and South American destinations including Panama, Ecuador, Venezuela, and Guyana. He toured the Falkland Islands, South Georgia, and the Antarctic Peninsula as an onboard Naturalist 13 times. He has presented numerous seabird identification classes at bird festivals across the country. His fondest pelagic memory was finding the first Northern Hemisphere record of Great-winged Petrel off the northern California coast. He's eager to share his knowledge of pelagic birds with anyone who will listen. 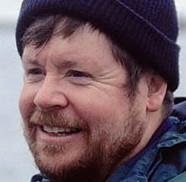 Greg Gillson founded The Bird Guide, Inc. in 1994, organizing and leading over 160 pelagic trips from Oregon. He served as president, secretary, marketer, web master, and pelagic guide until dissolving the corporation in December 2014. In addition, he has attended dozens of other pelagic trips off the Pacific and Atlantic coasts of North America and off western Mexico. Greg began birding in 1972 for a junior high school science project and never stopped. He enjoys teaching others about birds--both their identification and natural history. He has volunteered for shorebird and Marbled Murrelet surveys. He served on the steering committee of the Oregon Breeding Bird Atlas Project (1995-1999). Greg contributed more than a dozen seabird accounts to the 2003 book, Birds of Oregon: A General Reference, edited by Marshall, et al.. He enjoys birding mountain habitats and enjoys groups of birds that are an identification challenge, such as Empidonax flycatchers, shorebirds, gulls, and (of course) seabirds. He is adept at identifying Western birds by their calls and songs. Fulfilling a dream he and his wife shared, he now lives in San Marcos, California, attending--and sometimes guiding--San Diego pelagic trips.